Detection of H2S and protection of workers is a high-profile safety issue at well heads, and further down the pipeline (unless the gas or oil has been ‘sweetened’). Hydrogen sulphide is a highly toxic gas which is lethal at 1,000 parts per million (or 0.1%). Traditional H2S sensors do not survive well in the hot, dry environments, increasing the risk of an accident. Crowcon has developed a sensor capable of operating at 70°C, improving on electrochemical technology to produce a sensor to retain moisture levels, so preventing evaporation of the electrolyte, even in the harsh Middle Eastern climate. Crowcon's new HT H2S sensor works with the XgardIQ. The optional remote sensor housing means the sensor can be installed for optimal leak detection, while the transmitter's display screen and push-button controls are located for easy and safe to access, up to 15m away. The technology reduces expensive maintenance downtime. A combination of high-temperatures and low humidity can cause the electrolyte to dry out in the traditional sensor design, impairing performance so they must to be frequently replaced. This incurs excessive costs in replacement sensors and in the time and manpower. The new sensor avoids this occurrence. Crowcon will be presenting its new H2S sensor and its other gas detection solutions at ADIPEC 2018 in Abu Dhabi from 12th to 15th November. Crowcon will be on stand 8437 in the UK Pavilion. 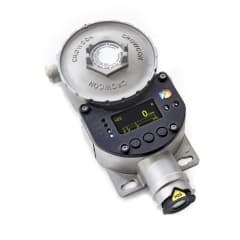 Crowcon provides a reliable H2S gas detection solution for operating temperatures up to 70°C.